Earlier today, the Centers for Disease Control and Prevention’s (CDC) Advisory Committee on Immunization Practices (ACIP) voted for permissive use of serogroup B meningococcal vaccine for older teens and young adults (full language below). A serogroup B meningococcal (MenB) vaccine series may be administered to adolescents and young adults 16 through 23 years of age to provide short term protection against most strains of serogroup B meningococcal disease. The preferred age for B vaccination is 16 through 18 years of age. Until now, the meningococcal vaccine recommended for routine vaccination only protected against four of five major strains of the disease (A, C, W and Y). Today’s recommendation is critical because, if accepted by CDC, it allows those 16 to 18 to decide, in collaboration with their parents and healthcare professionals, if they wish to be immunized against the fifth serogroup (B), which is currently the most common cause of disease in this age range. It will also ensure the meningitis B vaccines are covered by public and private insurance and medical practices will be more likely to stock and administer them. If your child has not received any meningococcal vaccines, he or she should get the recommended vaccine to protect against A, C, W and Y at age 11-12 with a booster at 16. When your child goes to get the booster, ask about the B vaccine. If your teen received at least one A, C, W and Y meningococcal vaccine, you should make sure he or she goes back for the booster at age 16 and ask about the B vaccine for ages 16 to 23. 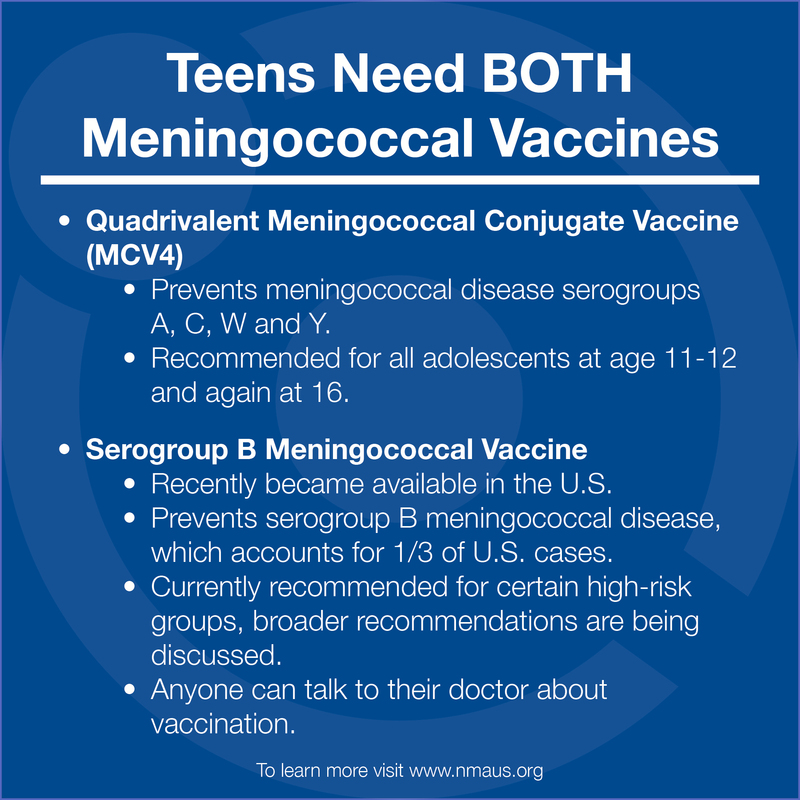 If your teen is up-to-date on meningococcal vaccines (including the booster), call your healthcare provider and ask about the B vaccine. Please help spread the word about the need for vaccination against all serogroups of meningitis. Educating parents, teens and young adults, healthcare providers and college administrators about available vaccination options is extremely important. Why Did We Need a Recommendation to #BVaccinated? Though rare, meningococcal disease affects persons of all ages in the U.S. and is potentially deadly. Serogroup B accounts for one-third of U.S. cases, and is the most common cause of disease in adolescents. From 2013 to 2015 alone, four college campuses experienced outbreaks of serogroup B meningococcal disease. There were also many isolated cases. In addition, about 1,240 people representing all 50 states signed NMA’s open letter to ACIP supporting broad serogroup B vaccination recommendations. We were overwhelmed by the responses from healthcare professionals, college health professionals, parents, college students, individuals touched by this disease and others who support prevention. We received more than 500 comments, which you can read here. This recommendation is an important step forward; let’s use it to make sure all teens are A, C, W, Y and #BVaccinated. On June 24th, the CDC’s Advisory Committee on Immunization Practices (ACIP) will be meeting to discuss recommendations for the serogroup B meningococcal vaccines which recently became available in the U.S. In February, they voted to recommend the meningitis B vaccine for a limited number of sub-populations at increased risk. While that was a step forward, NMA hopes ACIP will vote for recommendations to protect all adolescents and college students. We hope you’ve been following along as we’ve discussed why this recommendation is so important (if not, you can catch up here), and that we’ve inspired you to take action. ACIP accepts written testimony for review when considering its vote and NMA has developed an open letter to the committee (below) on which we would welcome your support. Let’s make sure no one else has to experience the devastating impact of this disease! For young adults, the future is full of hope and infinite possibilities. Meningococcal disease shouldn’t be one of them. We are writing to you because we or someone we know has been touched by this disease, or because we recognize the terrible impact this disease has on those affected (individual comments are attached). Those of us who were affected by serogroup B disease did not have the opportunity to protect ourselves or our loved ones. This disease can strike so quickly and can be indescribably devastating. One day someone is healthy and then the next day he’s fighting for his life. You’ve heard from many people who have lost loved ones or who have survived but will be dealing with the impact of the illness for the rest of their lives. There are many more whose stories haven’t been told. In recent years it has also become clear how even one case in a college setting has major repercussions as many colleges have had to deal with cases and even outbreaks of serogroup B on campus. Prevention is critical. The majority of people want to protect themselves and their children from meningitis; nearly 80% of U.S. teens receive their first dose of quadrivalent meningococcal conjugate vaccine. But that is not enough. Many people think that they or their children are fully protected by the currently recommended meningococcal vaccines. Others are asking their doctors for the B vaccine and are being told that it is not available or are having difficulty getting it. Now that meningitis B vaccines are available, we urge you to do the right thing. We urge you to recommend routine vaccination against serogroup B meningococcal disease, making it easy for all of us to protect our teens. Click here to sign on and show your support. The majority of U.S. parents get their children vaccinated with the quadrivalent meningococcal vaccine against serogroups A, C, W and Y (nearly 80% of U.S. teens receive their first dose). This vaccine is currently recommended by the Centers for Disease Control and Prevention (CDC) at age 11-12 and again at 16. Participants at the NMA roundtable noted that they believed this meant their children were no longer at risk of meningococcal disease. It’s something I hear from parents over and over again. They didn’t know about serogroup B. Teens need BOTH vaccines and we know that a doctor’s recommendation is the best way to make sure that they get them. Yet, without a routine recommendation the message healthcare providers will have to give to patients is “the CDC recommends that your child be vaccinated against meningococcal disease, but this vaccine won’t protect against all strains of the disease. There is an additional vaccine that protects against the strain most common in adolescents. It’s not recommended, but your child can get it if you want.” This is an extremely complicated message for healthcare professionals to deliver. And more importantly, it’s a hard message for a parent to hear and understand. We can’t expect parents to know that their children are not protected against serogroup B and we can’t expect healthcare providers to act without strong guidance from the CDC’s Advisory Committee on Immunization Practices. That’s why we hope that on June 24th, the Committee will do the right thing and vote for a recommendation for teens to #BVaccinated.